While the casino games are a big focus of CasinoRPG, the casinos themselves play an equally large role in the gameplay. Once you've worked your way up and become an established gambler, you can purchase your own plot of land and build a casino of your own. This is the main tycoon aspect of CasinoRPG, and it allows you full creative freedom to design the casino of your dreams. 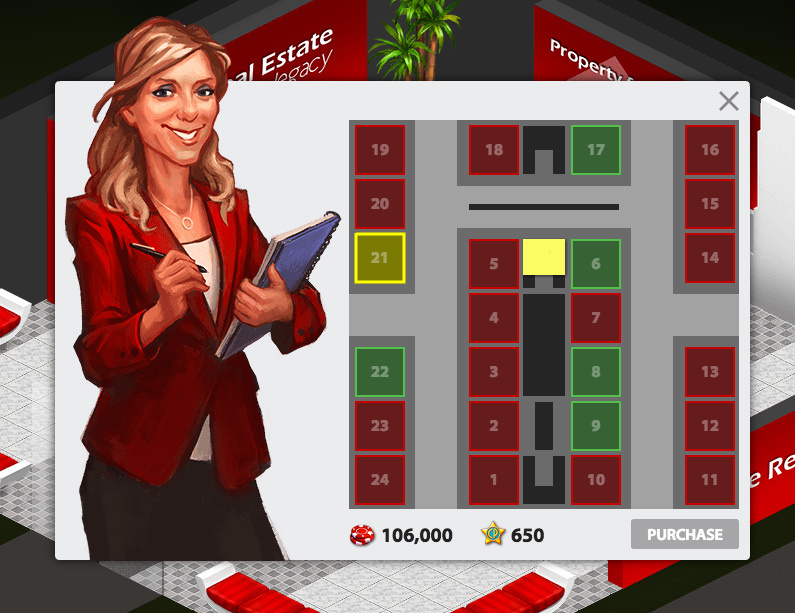 You are also handed the controls to manage the casino in anyway you see fit in a unique real-time, multiplayer tycoon environment. Once open, be sure to invite your friends to come visit your creation! In order to build a casino, you must first acquire a property. You can purchase plots of land by visiting the Real Estate building in the zone of your choice (marked in yellow on the map). If a zone is full, travel to a different area where there are open lots. All properties were not created equally, which is why the prices differ quite a bit from lot to lot. The location of your casino actually has an impact on its potential popularity. For example, a property will be more expensive if it is closer to the town square or a park. Properties are also limited in the directions that casinos can face (never towards other casino lots), which also has an impact on property valuation. Your casino's status is the overall measure of how well your casino is doing. Every aspect of your casino is used to calculate status, and if even one area of your casino is suffering, it will have a large negative impact on your casino's overall status. You can view your per-hour profit breakdown by clicking on your profit display in the Metrics menu. In addition to being affected by how many patrons you accommodate, you can alert this metric by purchasing and upgrading items that have values under the piggy bank icon. This measures how clean or dirty your casino is. The more people you have coming in and out of your casino, the more trash that is going to be dumped. Items with a value for the broom icon will positively or negatively affect the amount of trash in your casino. The more popular your casino, the more patrons and revenue you will receive. Unlike the other metrics, this can go above 100 as your casino can continuously become more and more popular. Advertising, VIP visits (which are visits by real players) and items with the trophy icon have significant impacts on popularity. It is important to manage your casino in such a way that keeps your employees happy; otherwise, you'll have mutiny on your hands and employees will be quitting left and right! You can see overall morale in the yellow section of the metrics, and you can drill down to a per-employee basis by clicking on the icon with this section. Employees will give you tips on how you are doing with regards to affecting morale. Crime has always been an issue in casinos, but there are many options these days to combat this. You can hire Pitbosses to help mitigate these issues, but it will be largely up to your item selection and management of the casino at large (the lock icon indicates an item's affect on security). The lower the security, the more money you lose to cheating. Capacity is a metric that factors heavily into your profit. This is mainly affected by the items you have in your casino, and can be seen by the icon of two people. Essentially, this is the max number of patrons you can accommodate in one hour period, and you can see how this compares to your total visitors from the profit window. Environment Rating is the overall measure of the quality of your casino's floors. This takes into account many different elements, and no one type of layout is best. When designing your floor, you should think how a real casino floor would be setup to maximize playability and enjoyment of the atmosphere. Negative values negatively impact other casino metrics, and positive ratings have positive impacts. These employees play a vital role in not only keeping your casino floors clean, but also keeping the gardens fresh and the games up and running. Liven up your casino with some entertainers and watch the patrons flow in to have a good time. Make sure nobody is cheating, getting in fights or stealing from other patrons by getting some pitbosses on your staff. If you purchase a bar in your casino, it won't be very effective in generating revenue if you don't staff it with a bartender. You don't want to have to micro-manage all of these employees, so get yourself a few managers to do the dirty work for you. All customizations are performed through the Editor, which can be accessed from within your casino floors or from the Properties app on your phone. When earning profits from your casino, they will automatically be deposited into your vault as you earn them. You can visit your vault anytime at any of your casinos and withdraw the chips to your wallet. However, if your casino is running a loss, the chips will be taken directly from your wallet once the vault is empty. Also, keep in mind that the vault has a storage limit, and once it fills up your profits will not be stored until you come back and empty out the vault. In addition to storing chips, you can also store items in your vault. This not only makes it easier to rearrange your floors, but it also allows you to move items from one casino to another or one floor to another.